Blackinton B1268 7 Point Star Badge - B1268 - 1 5/8" x 1 5/8"
Home > Blackinton > Police Badges > Star Badges > B1268 7 Point Star Badge - B1268 - 1 5/8" x 1 5/8"
B1268 7 Point Star Badge - B1268 - 1 5/8" x 1 5/8"
Blackinton B1268 is a 7 pointed star shaped badge with a decorative leaf design in the points. Personalize the B1268 with your rank and department information on the ring and bottom point panels, giving you up to three lines of text, and choose your state seal for the center. Blackinton 7 Point Star Badge B1268 measures 1.625" x 1.625" and is made in the United States of America. Please allow 4-6 weeks for this customized product to be delivered to you. 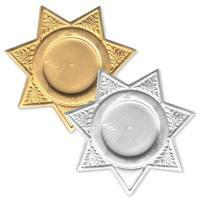 ©2002-2019 CopsPlus.com: Blackinton B1268 7 Point Star Badge - B1268 - 1 5/8" x 1 5/8"